Technology has made news more accessible for today’s audiences. With technology, the accessibility of news is changing. The mediums on which audiences prefer to access news are changing. The mindset of audiences is changing. Aware of this, Jason Feifer, editor in chief of Entrepreneur magazine, stressed the need for innovation and risk-taking in journalism. Feifer shared his experience working with entrepreneurs, and how their thought process has affected his thought process. 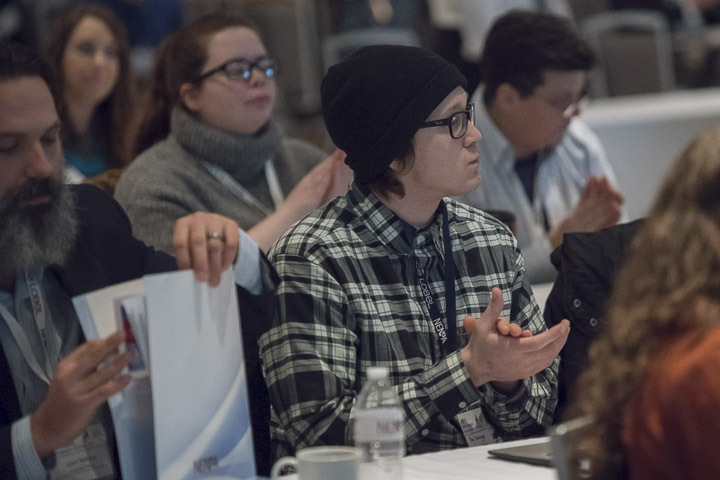 More than 100 journalists and students gathered for his keynote speech Friday, Feb. 23, the first day of the New England Newspaper and Press Association’s two-day 2018 winter convention at the Renaissance Boston Waterfront Hotel. Feifer’s take-home mantra was to live in a state of “permanent beta.” It values the state of change, of malleability, of everlasting evolution. What interests Feifer is that entrepreneurs are familiar with being uncomfortable. They might even be comfortable with it; they know that what works today will not work tomorrow. He touted the merits of permanent beta — focusing on sharing a product with a community rather than on ownership of that product. He introduced his podcast, “Pessimists Archive.” With each episode, the speakers on the podcast discuss moments when new technologies were introduced, and why those technologies initially perplexed and terrified people. His example was the invention of the bicycle in the late 1800s. Feifer emphasized that employers and industries panicked because the invention of the bicycle changed consumption patterns. Specifically, the hat industry felt threatened by the novel technology because they thought that felt hats would be blown off the heads of bicycle riders, who would therefore buy fewer felt hats. In fact, the felt hatters pressed for Congress to approve legislation for bicycle owners to purchase at least two felt hats a year. Members of the audience chuckled at the absurdity. “And yet, haven’t we done that in some sort of way ourselves?” Feifer asked. Members of the audience leaned in intently. “We’ve said, ‘You know what, I know how to do something well, I’ve been doing it well for a long time, so everybody else needs to stop so I can keep doing this thing’,” Feifer said. In the long run, if the fancy felt hatters had just accepted and embraced the change of selling other types of hats, such as ball caps, they would have made a tremendous profit: Currently, the hat industry has produced more than double the revenue of the bicycle manufacture industry and the bicycle repair industry combined, Feifer said. But because the felt hatters did not embrace the change, they realized limited opportunity and room for their growth. His approach doesn’t apply just to entrepreneurs, he said: Journalists need to find solace in innovation. Like the hat industry, the news industry has felt and will feel threatened by the invention of new technologies. The solution is not to tear down that new invention or force people to interpret the news the same way, simply because that way worked in the past. Feifer said the solution is to ask questions and innovate. The solution is to take risks in the industry and figure out what the readers and listeners want to read and hear, and how they want to read and hear it. “Entrepreneurs always ask themselves, ‘Why am I doing something the way that I am doing it?’ If the answer is, ‘Because that’s the way things have always been done,’ that answer is wrong,” Feifer said. 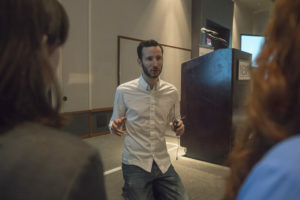 Feifer recollected that when he first became editor in chief of Entrepreneur in October 2016, he didn’t know how to connect with his audience of entrepreneurs. He talked about his experience at the Gardner (Mass.) News and Telegram & Gazette of Worcester, Mass., and his decision to freelance because of his desire to target a larger audience. He also discussed his later journey through different magazines, including Maxim and Men’s Health, and ending with becoming executive editor in 2015 and editor in chief in 2016 of Entrepreneur. Audience members shared expressions of wonder. “What if the content is the reason why people trust us and love us, but not the reason why we make money?” he asked. Then Feifer discussed an idea that resonated with the audience: Established magazines, newspapers and podcasts have great brand equity. He said readers of magazines and newspapers will almost intuitively say: “Oh, I love (a certain magazine)!” and when Feifer asks them what they like about it or if they read the latest issue, they reply that they haven’t read the magazine in years. “If that’s the situation, what is that saying?” Feifer said. “It says people love brands,” he said. “They love us, but they won’t pay for our product. And even if we’re providing it for free, they still don’t read it. There’s a gap here. He acknowledged that that was an uncomfortable idea, and that intrigued him even more. “What if the content is the reason why people love us and trust us and will continue to do what it has always done, but it is not the thing that finances us?” he asked. Feifer said the relationship between consumer and producer shouldn’t be one with rigid boundaries. “What if journalists aren’t the only ones who can tell stories?” he asked. Feifer said that, despite his preference to leave the writing and storytelling up to him and his fellow journalists, the reality is that readers like to write. What’s even better is that they like to read what they write. Feifer introduced the idea of contributor networking. Readers can submit pieces to be published, potentially, on the Entrepreneur website. His suggestions about letting readers become writers, and other ways of engaging audiences, had the ring of a hat manufacturer encouraging bicycle riders to wear different hats. An appreciative audience applauds Jason Feifer’s keynote speech.